What are your fitness goals? What do you want to achieve from your training sessions? How do you want your investment of time and money with a personal trainer to pay off? The answers would probably be something like weight loss, muscle gain, an increased level of fitness in terms of flexibility and strength, recovery from a prior injury, an improved golf or tennis game, ease in functional activities. Heavily marketed fitness programs are a hard sell, but take time to look at the fine print – is it safe and reliable? If not, how effective can it be? There are gimmicks in the world of fitness, full of promises but lacking effectiveness and, at times, causing injuries. Pilates, however, is a safe exercise and has been around nearly 100 years. It’s a system of exercises that can be individualized to suit each person’s needs and fitness level, and a skilled instructor can use these same exercises to help overcome weaknesses caused by old injuries. Resistance training is at the heart of Pilates, but that resistance is used with control in order to preserve correct form. This training includes activities that use weights, machines, resistance bands or even body weight to work your muscles properly. When the equipment is used, the muscles of the body will be pitted against the resistance of weighted springs. The cells of the body will then adapt to the extra resistance, enlarging and increasing the strength of each muscle cell to help in the muscle perform contractions more efficiently. The exercise system designed by Joseph Pilates in the early 20th century offers resistance training without using heavy weights. German-born Pilates created the program during his World War I internment in England. To encourage fitness in his fellow internees, Pilates fashioned resistance training equipment from bed springs and parts. After the war, Pilates immigrated to the United States and continued to develop the method in the same building as the New York City Ballet. The exercises were first embraced by the boxing and ballet communities. Under the watchful eye of a Pilates instructor, a client performs a series of exercises that require movement against the resistance of springs. This is not a one-size-fits-all program, nor are the exercises performed quickly or competitively. The equipment was designed so that the instructor guides the student through a series of movements, isolating specific areas of the body. This aspect of Pilates is especially useful when a client may need rehabilitation from injury or surgery, such as hip or knee replacement surgery. An educated trainer can recognize limited range of motion and modify exercises to prevent injury while increasing flexibility and strength. Practicing Pilates means training all of the core muscles. Pilates builds strength and flexibility. Instructors must be trained and certified to properly adjust equipment to individualize resistance training. Pilates exercises are performed slowly in order to achieve the best results. Energy flows from a strong core and a focused mind into the student’s arms, legs, even into their fingers and toes. Practiced on a regular basis, the client develops strong muscles that are long and lean, sculpting the body. What happens beneath the skin is that resistance training also creates strong bones, and that’s important because as people age their bone mineral density decreases. Developing a strong core involves conditioning your abdominal muscles, the postural muscles in your back and the muscles that wrap your trunk connecting the two. The results may not be weight loss, but things like increased stamina, flexibility, and improved mood and maybe even a positive change in the way clothes fit. Why not get some professional help to assist you in reaching your fitness/ lifestyle goals? 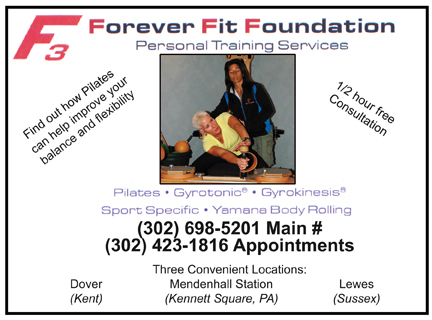 Schedule a consultation with a personal trainer at Forever Fit Foundation where new clients receive a complimentary consultation to address goals. Most find that working with a trainer maximizes their time spent in the Pilates room and the gym. There is a tremendous advantage to have an experienced trainer not only to encourage, but also to provide variety to your workout. The benefits of Pilates are achieved with precision. A trainer assists in assuring that you are moving correctly, modifying exercises to meet your specific needs. Many find that professional support is a worthwhile investment in our health and fitness.